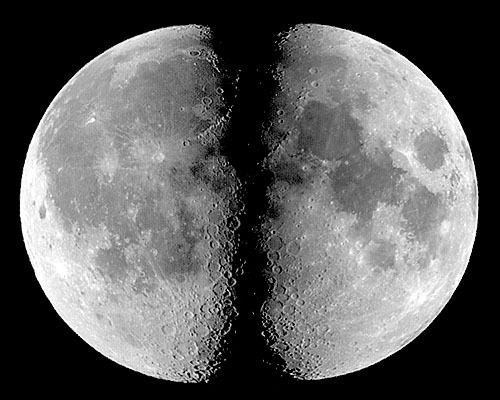 Welcome to MOON-"Light", an interactive Atlas of the Moon entirely produced from images grabbed with an inexpensive web-cam, the grayscale QuickCam (from Connectix/Logitech), using two Schmidt-Cassegrain telescopes (4" and 10"). It is still an on-going project, but already has more than 700 lunar formations mapped. For more details on how to modify and use this camera to obtain astronomical images see the "QuickCam Astrophotography" section of this web-page. The basic units of this Atlas are stand-alone "card-files" like that shown at the top of this page. 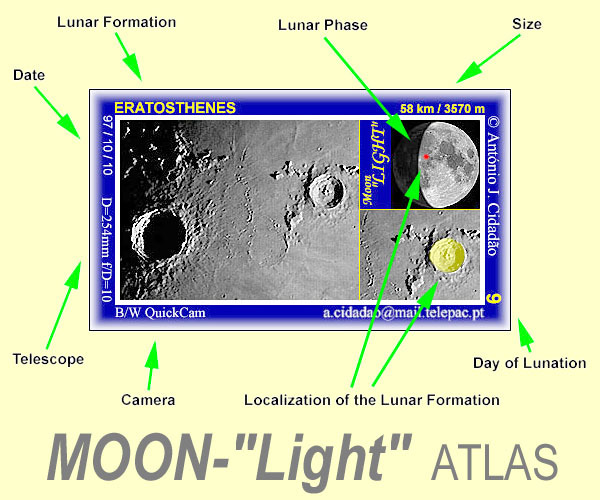 Each "card-file" refers to a specific lunar formation, and contains the most relevant information: name, size and localization of the formation (low-magnification and close-up views), date, day of lunation and lunar phase, as well as camera and telescope used. "Card-files" can be easily accessed by pushing any of the image buttons shown below. As the number of named craters on the visible surface of the Moon is very large, these formations were arranged both alphabetically and according to the 76 sections of the excellent "Atlas of the Moon" by Antonín Rükl. I strongly recommend all interested in lunar observation to acquire that Atlas. The quality of its drawings and images is remarkable, and it is full of relevant information. Although MOON-"Light" bears an extensive collection of identified lunar formations, the higher-resolution images of the Moon I have obtained so far are all grouped in the "CCD images of the MOON" section of this web-page. Please feel free to visit it. The same applies to the "Observation of the MOON" section.